Google Apps for Business is a great solution for companies that want email, calendar and documents hosted in the cloud by Google. Mindscape, where I work, has used Google Apps for Business for a number of years now. It allows me to have aaron [at] mindscapesolutions.com as my email address. What it did not allow in the past was for me to access tools like Google Reader, Checkout, Picasa, and a number of other popular, ancillary services from Google. 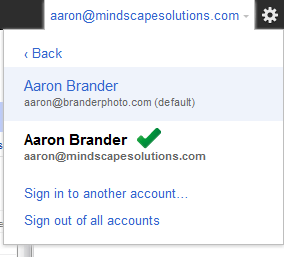 What I could do, however, was create a second Google account using the same aaron [at] mindscapesolutions.com address. This account had to have a separate password, but as a standard Google Account, I had access to those other Google Services. I wasn’t interested in using my work email to access those other services. So I made it even more complicated. My wife runs her own photography business, http://www.branderphoto.com. I use aaron [at] branderphoto.com as my personal email. It’s also a Google Apps for Business account. So, when I wanted to access Google Reader, and Checkout and Analytics and Picasa, I had to have a separate aaron [at] branderphoto.com account, with a different password, to access those accounts. The plus side of this arrangement is that I could have aaron [at] mindscapesolutions.com signed in and accessing email, and in another tab of my browser, have aaron [at] branderphoto.com signed in and accessing email. The down side is that I would also have another tab open, with my other aaron [at] branderphoto.com account signed in, to access Google Reader. All in all, it was as confusing as it sounds. So, it was with much rejoicing, mixed with some trepidation, that I transitioned my Branderphoto.com account to the new Google Apps for Business model last week (http://www.google.com/support/a/bin/answer.py?hl=en&answer=181867). With the new model, my branderphoto.com account will function just like a real google account and have access to all of the Google Services. So I made the switch. I had to create a new google account to hold my secondary branderphoto.com account data. Apparently it wouldn’t just merge them together. The biggest pain here was exporting my Google Reader subscriptions and importing it to my upgraded branderphoto.com account. Not super painful, but not as smooth as I would have liked it. So, after reading a few blogs in my improved branderphoto.com account, I decided it was time to try clicking on a Google +1 button and see how that worked. Epic Fail. Apparently, my improved branderphoto.com account isn’t completely a real Google Account. Services like Google Health (I don’t care), Google Power Meter (no matter to me), and Google Profiles (what!?) don’t work with Google Apps for Business users yet. Soon after, I had a chance to try the new Google Plus service. Turns out I can’t use that with aaron [at] branderphoto.com. And now that my secondary aaron [at] branderphoto.com is no more, I would have to use some other Google account to create my Google Plus account. I have no desire to add yet another layer of complexity, so I guess I’ll be out of the Google Plus loop until my Google Apps account is fully functional. Google Profile seems central to all that Google is trying to accomplish, so making my Apps for Business account behave like a regular Google account, but leaving out Profiles is like having an ice cream cone but leaving out the ice cream. Who wants that? I got over the pain of not having a Google Plus account. It wasn’t that hard to do. Today, however, more pain came. My mindscapesolutions account was transitioned to the new model. Since it also acts like a regular Google account, I can no longer have my branderphoto.com and my mindscapesolutions.com account signed in at the same time! Ack! Now I have to use Google Chrome, and Internet Explorer to have keep my business and pleasure separate. It’s a pain, but one I can deal with. However, there’s one other way to handle it. You’ll need to enable sign in to multiple accounts. Now, you’ll need to sign out of your account and sign back in. You should see a new “Switch Accounts” button in the options area. Click on that to see all of the accounts that have can log into. The first time, you’ll just see one account. Click the sign into another account link and log in to the new account. You’ll then be able to switch back and forth between the two in the same browser! Now, if they just get Google Profiles working….